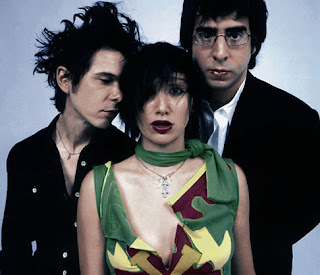 As any decent fan would, I spent the two weeks prior to the Its Blitz release rekindling some Yeah Yeah Yeahs love by plugging in the all the old tracks. Oh the sweet, sweet glory was all too encouraging. 2001's self titled debut brought garage punk into a notion of ferocious and dreamy; and from there a rapid succession of albums would follow. The band's rawness and gritty charm is footed by lead singer Karen O, as she invokes a power and presence comparable to past riot grrrls like Kathleen Hanna and Joan Jett. Moody romance, twisted angst, and a fine induction of generalized chaos have come to define the band's main sound. So where did it all go? It seems that the band has opted for another direction entirely with Its Blitz. Gone are Karen's painstaking growls and screams backed by guitar prowess and heavy drums. There is a softer mindset with an emphasis on synth and electro beats. The album holds a few upbeat dance tracks, but with a slew of slower, heart heavy songs, the album is --initially-- a 'soft shock' to the system. That being said... I am head over heels. If fans can get past the fact that the band has opted for a lighter vibe, then they will realize that its still packed with true bite. There is an emotional lift evident, which makes me curious as to what is going on in the personal lives of the band. Has Karen O found love? Brian talked in his blog about experiencing spiritual enlightenment upon becoming vegetarian. What has sparked such an obvious shift in sound?? Thoughtful ballads like Skeleton and Runaway display a delicate and childlike sense of the band that chills to the bone. More upbeat songs like Heads Will Roll and Zero play definite dancibility and are probably the closest thing to the out of control madness fans know and love. The band also offers four acoustic versions of tracks off the album, allowing for a new level of intimacy. The interesting collaboration with a stringed orchestra for Little Shadow is delightful and refreshing. Overall, the Yeah Yeah Yeahs have delivered another premium album and a solid playlist. Although the band has surrendered to the popular synth-beat era, it has been done respectively and in moderation. The fast and fiery attitude of Karen O is still in place, however a fresh and inner peace-ed mentality shines through. Its Blitz is a new and exciting record for YYY fans to maintain steady grooves and a sweet escape.